Te Matua Ngahere, originally uploaded by Dunk the Funk. 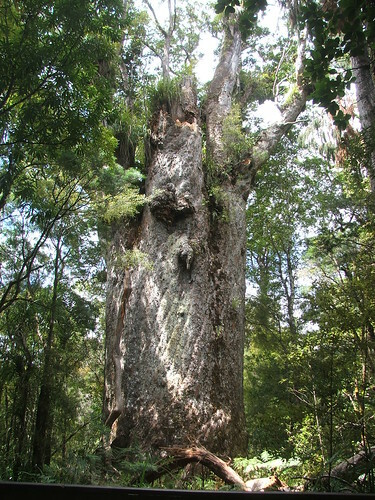 This large Kauri tree (Agathis australis ) is reported to be the second largest tree in New Zealand. It's name "Te Matua Ngahere" means "Father of the Forest" in Mauri. It appears to be shorter and stouter than its neighber the Tane Mahuta tree. Tremendous. Big trees are some of the most excellent things in nature. I used to spend weeks hiking in the Pacific Northwest, the states of Washington and Oregon, and of course the coast and Sierras of California. Baobab trres from Africa are cool as well. I wish I could have seen what these giants, especially the Kauri, looked like in pristine forests. Will these trees grow in Cali?